Carolina Plantation Fish Fry is an award winning breader developed by “Mr. Bobby”, the outstanding wild game chef at our hunting lodge, Roblyn’s Neck Trophy Club. 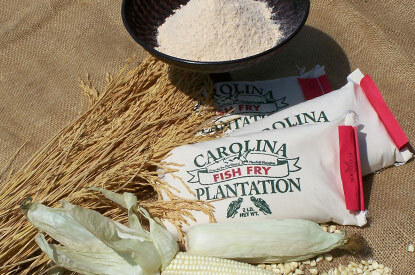 Originally tailored for his famous Pee Dee River Catfish Fry, this delicious and unique blend of Carolina Plantation white corn meal and Carolina Plantation rice flour is also perfect for frying poultry, seafood, and vegetables. The special ingredient is our rice flour, which produces a delicious, crispy, and very light coating and gives any fried food that coveted Carolina Plantation Aromatic taste!